Who can lay a complaint against the media? Anybody who feels aggrieved by something that was published or broadcast, as long as they have a direct interest in the issue. Complainants have to waive their right to go to court about the matter afterwards. Can a complaint be laid against any member of the media? It can be laid against any newspaper, radio or television station in Namibia. It is not the individual journalist who will be called to account, but the media house itself, usually through the editor. What kinds of things can lead to a complaint? Any breach of the Code of Ethics of the Namibian Media. This would include cases of inaccuracy, unfairness, invasion of privacy and many others. Please have a look at the Code of Ethics for full details. How should a complaint be laid? By writing to the Media Ombudsman, no later than 14 days after a story was published or broadcast. The Ombudsman may accept a later complaint if there is a good reason. He mauy ask the complainant to supply a copy of the offending item. What will the Media Ombudsman do with the complaint? He will first try to mediate between the complainant and the media house, to find a mutually acceptable solution. This could involve the publication of a reply, an apology, retraction, follow-up article or similar. The Ombudsman will either decide the issue on the basis of the written documents, or hold a hearing together with two members of the Media Complaints Committee panel. What happens to the media house if they are found to be in the wrong? They can be cautioned or reprimanded, told to publish or broadcast an apology, a retraction, explanation or the reply of the complainant. 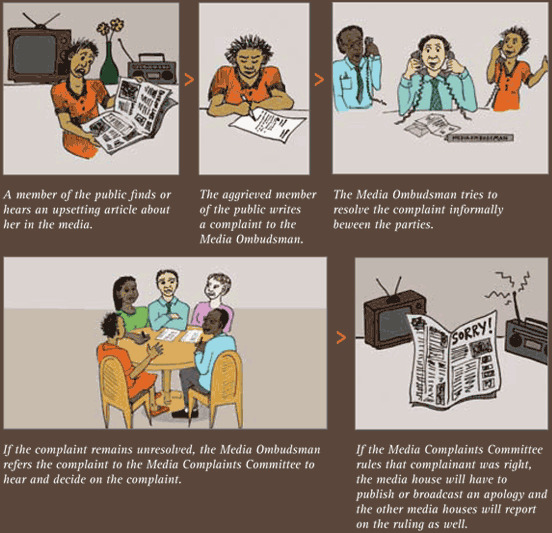 Other media will also publish the decision of the Media Ombudsman and the Complaints Committee. What happens if either side is unhappy with the ruling? They can appeal to the Media Appeals Chairperson, who will have the final say.